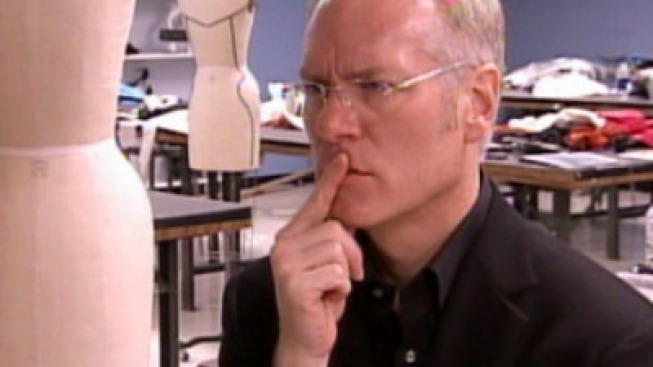 For fashion novices in need of a closet consultation, "Tim Gunn's Fashion Bible" is out Sept. 11. With another season of "Project Runway" wrapping up, a monthly fashion column in People StyleWatch, and his "Fashion Bible" about to hit bookstores, Tim Gunn is a man people want to meet. So when Gilt City hosted a book party for The New York Times bestselling author and "Project Runway" mentor, tickets sold out within an hour. “It’s like giving birth, and you’re really happy when the baby is pretty. And this baby is pretty,” Gunn joked about his new book. "Tim Gunn’s Fashion Bible" is broken up into chapters by article of clothing, with the first chapter devoted to the basics: underwear. The appendix includes a closet worksheet equipped with size charts, a self-inventory checklist, and the proverbial questions one must ask when examining one’s own closet. For example: Do you have a suit to wear to a wedding? Gunn addressed the crowd inside the cool walls of Wollman Hall at the New School, where he spent more than 20 years on the faculty. Since you can't go to a Tim Gunn event and commit sartorial sacrilege, the attendees were chicly decked out in their summer's best (floor-sweeping maxi dresses, lace eyelet skirts, neon greens and purples). With advanced copies of the new book in hand, guests sipped prosecco and readied themselves to soak in nuggets of wisdom from the fashion maven. Where do you turn for inspiration when you’re in a fashion rut? "To be honest I’m a very lucky guy, I’m never in a fashion rut. I find inspiration absolutely everywhere." Any favorite article of clothing? "As a man I’m always grateful for a jacket because no matter what’s underneath, you can’t see it. But in fashion, generally it doesn’t matter. It’s all about silhouette, proportion and fit." You’ve coined "Make it work" as your tagline. If you were to coin a new catchphrase, what would it be? "It would just be another version of 'Make it work,' with maybe some expletives involved…Don’t blank it up!" Do you ever worry your criticism will get you in trouble? What’s one of the more interesting things you’ve discovered while researching for this latest book? "Draping goes back to Greece and tailoring goes back to Egypt, literally thousands of years ago." Tim Gunn's Fashion Bible: The Fascinating History of Everything in Your Closet is out Sept. 11.